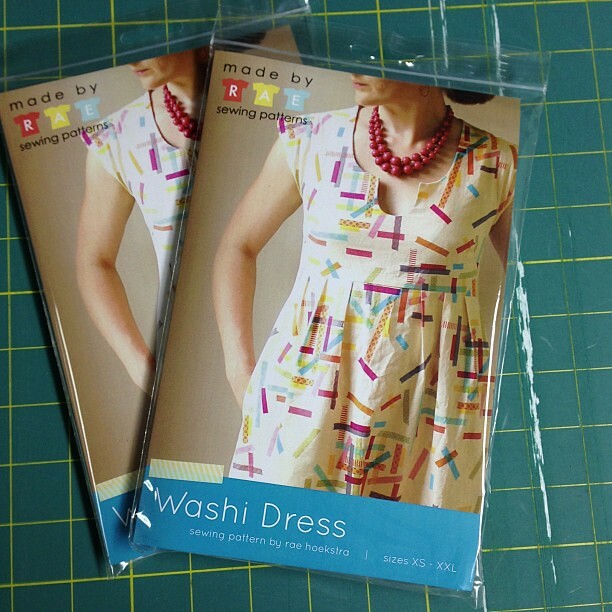 This workshop is designed to offer time to work on the Washi Dress with the pattern designer Rae's assistance. Rae will also cover many of the sewing techniques needed to complete the Washi Dress. Possible topics are: sewing a smooth dart, shirring with elastic thread, adding facings, seam and armhole finishing, and hemming. These techniques are commonly used in many other women's (and even children's) clothing patterns as well! Please note that due to time limitations, we will not be able to sew an entire dress from start to finish; we ask that you cut your pieces before you come. However, Rae will be available to assist you and answer questions specific to your dress. To see a huge gallery of beautiful Washi dresses sewn by and for women all around the world, check out Rae's recent blog post. Rae Hoekstra is a blogger and pattern designer at Made By Rae (made-by-rae.com), a popular spot for DIY and sewing tutorials. She also designs fabric for Cloud 9 fabrics, is a Sew Mama Sew Board member, and co-hosts SEMI Crafty meetups once a month at Pink Castle Fabrics. Ginia’s machine quilting classes focus on building a strong foundation of basic skills and encouraging the student to develop their own style. This class focuses on free motion quilting for the beginner. If you have never tried free motion, or tried it and gave up, this is the class for you. You will learn the basics about different kinds of batting and thread, how to set up your machine and workspace, how to make quilt sandwiches. Then we’ll move on to practicing some fun filler motifs for the beginning quilter. Ginia Forrester is a quilter who has made many amazing quilts, and is pursuing her interest in historical quilts by becoming a quilt appraiser. There are a lot of ways to make circles in a quilt. Come to Pink Castle and learn Rossie's reverse applique method. Students tell us they find this method "fool proof" and have 100% success with it in class and at home! Rossie's method can be used to make perfect circles or more irregular shapes (as in the picture). She developed this method when making her Painted Pebbles Quilt, which is now part of the American Quilter's Society Modern Challenge! Rossie will also teach the 6-minute-circle technique and go over the pros-and-cons of this method vs. her reverse applique method. Students will leave class with at least one completed block and a handout to remind them of what they've learned! Rossie Hutchinson is the founder of the influential Flickr group Fresh Modern Quilts. Her quilts have appeared in magazines, books, and quilt shows around the country. She also creates and sells custom plexiglass shapes for itajime shibori dyeing and other uses. Are you a quilter who is ready to take baby steps into the world of garment sewing? Learn to use your mad sewing skills to make something you'll love to wear! Are you a beginning sewist ready to try out a clothing pattern? Come and learn a basic pattern with us! Karen LePage designs sewing patterns, teaches sewing classes, volunteers in the Ann Arbor and Detroit crafty communities, and makes bespoke garments for people who are sensitive, hard-to-fit, or just too individual for off the rack clothes. She co-hosts SEMI Crafty meetups once a month at Pink Castle Fabrics. We hope you can join us for some fabric fun this month! And don't forget to add your projects to the Made with Pink Castle Fabrics Flickr group.